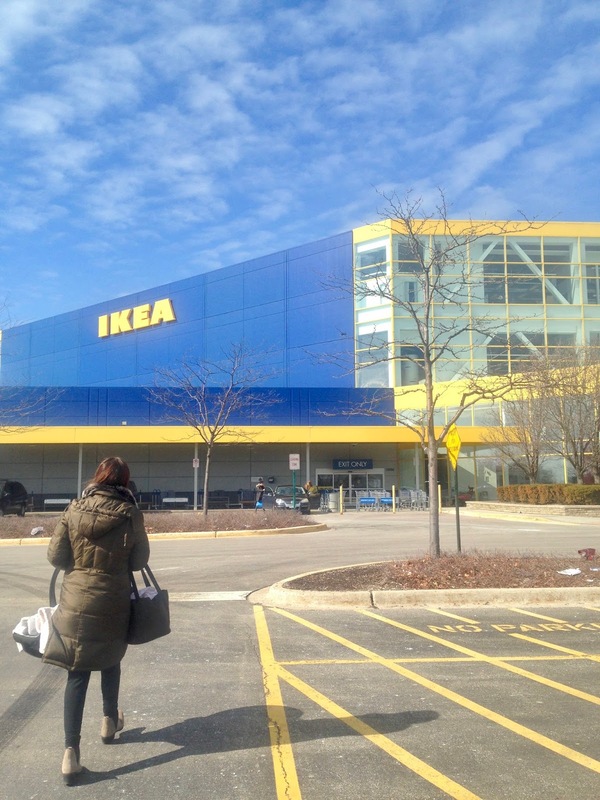 I know not everyone would consider a trip to IKEA a travel adventure, but I do! I live in the country and my nearest IKEA store is two hours away, so I don't get to one too often...maybe once every 10 years! 😂 So when I was visiting my children in Illinois last February we thought a day in an IKEA store would be an adventure. And it was! We spent the entire day in the store and had a blast! The IKEA we went to was in the midst of a remodel so we had a hard time finding a cart. Poor Ashley's arm was about to break off holding the baby in her carrier while we walked everywhere looking for a cart. 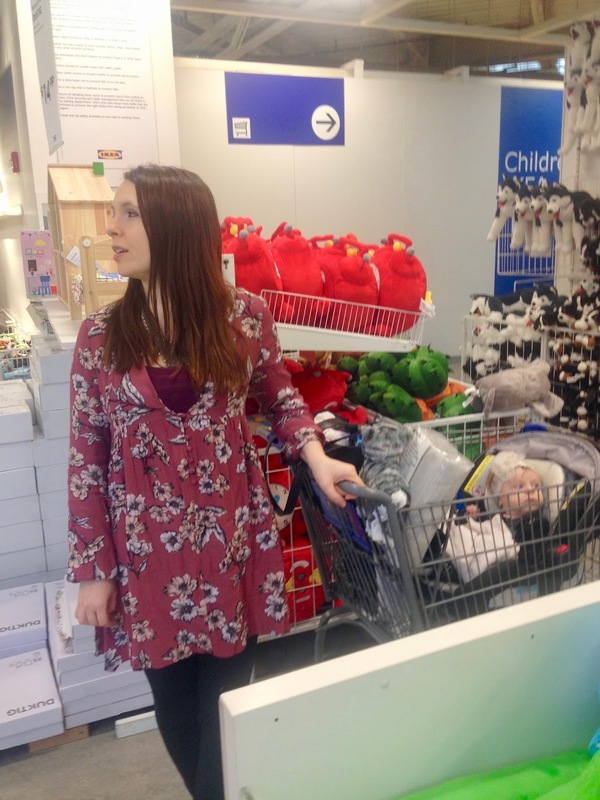 Finally I said, "How about I just stand in one place with the baby while you find a cart?". Minutes later Ashley came back with a cart and baby Alethea was as snug as a but inside. Just look at those beautiful baby blues! She was so good and content all day. Of course she had a lot to look at with all the wonderful, fun things IKEA has hanging from the ceiling. I found this little kitty in the stuffed animal section. It reminded me so much of my own cat Jackson that it had to come home with me. I was hoping Jackson would accept it and play with it. He's had the same stuffed teddy bear that he's had since he was a kitten. He drags his teddy all over the house, and kneads it when he is lonely or anxious. It is literally falling to pieces. I've sewn it up so many times, and it keeps falling apart. But no, Jackson would not accept a new stuffed animal. He would have nothing to do with it. But the funny part of this story is when Alethea came to visit us for Easter, she discovered the kitty and became so attached to it that I gave it to her. I wonder some times if Alethea thinks it's Jackson. Jackson won't have anything to do with Alethea and he runs away every time she comes near. Maybe this kitty is a substitute for Jackson? Who knows? Alethea has never become attached to any other stuffed animal before. Funny how she became attached to this one. 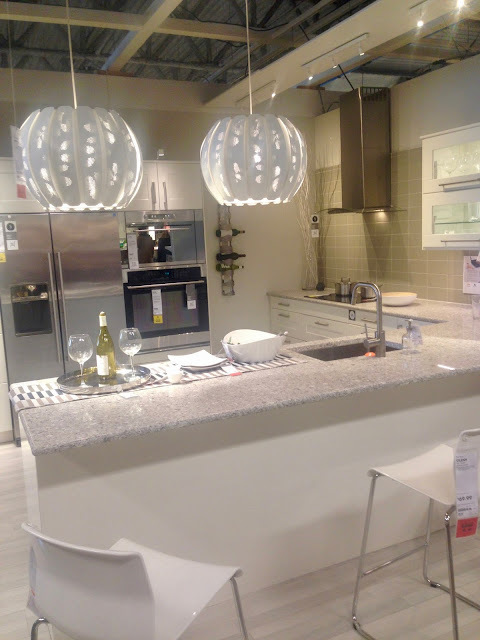 IKEA is my new favorite place to get ideas. I love to walk through the store and "ooh and ah" over all the displays. 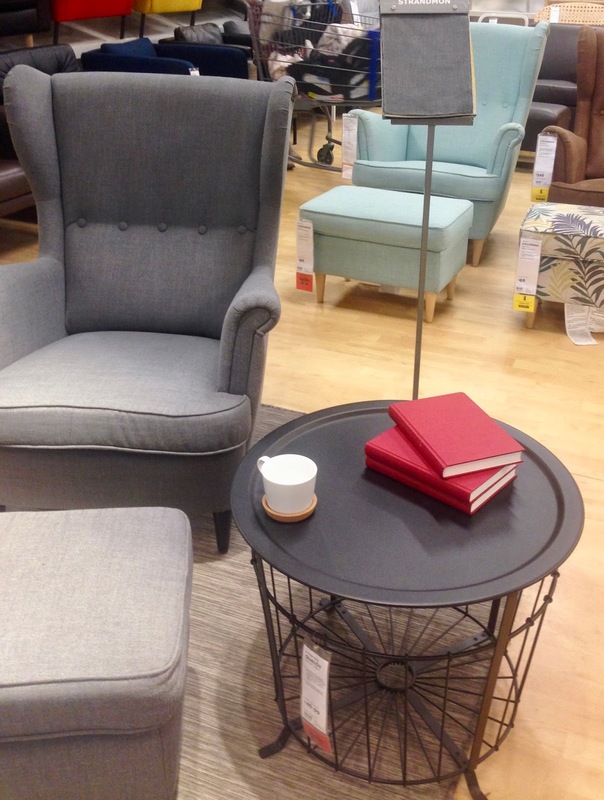 I love to take pictures and make notes on ways to improve my own home. I love subway tile; who doesn't? 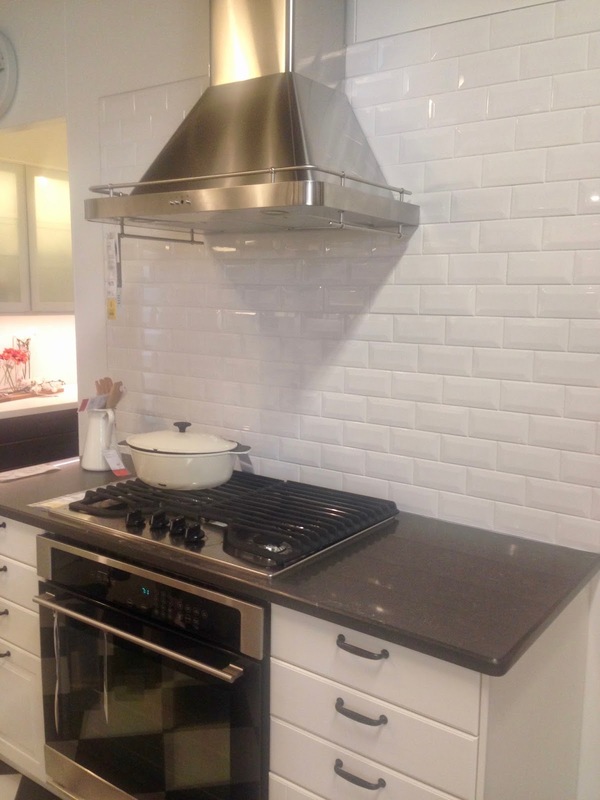 Doesn't this make a great back splash for behind a stove? So easy to wipe up splatters! 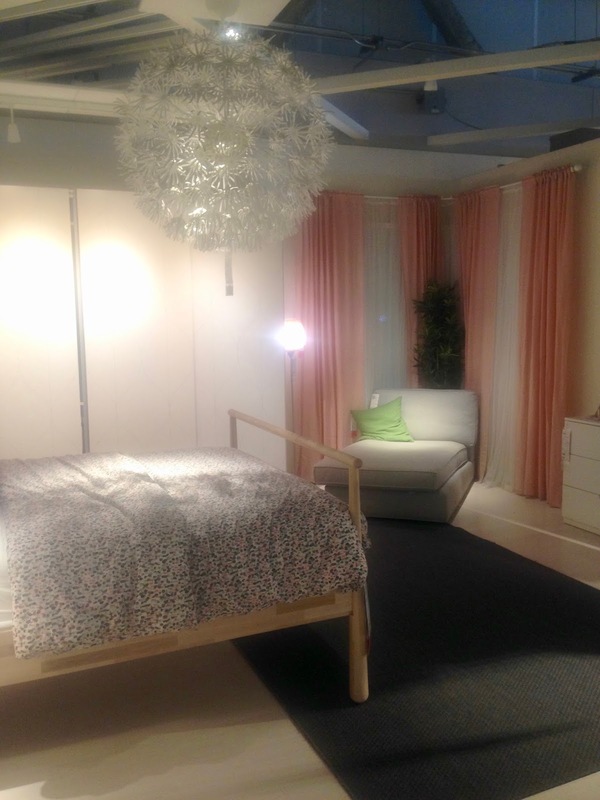 At the time I was visiting this IKEA store, I was still looking for ideas to for my guest room remodel. (It has since been finished; look for a big reveal post coming soon!). This room caught my eye because of the gorgeous millennial pink drapes and the romantic light fixture. I think the smartest thing about IKEA stores is that they have a restaurant in the store. Their stores are so big, that they take hours to explore. No one likes leaving a store early to go grab a coffee or a bite to eat. So we had lunch here and enjoyed some down time resting our feet. I had a salmon sandwich and a cup of coffee. It was so good. 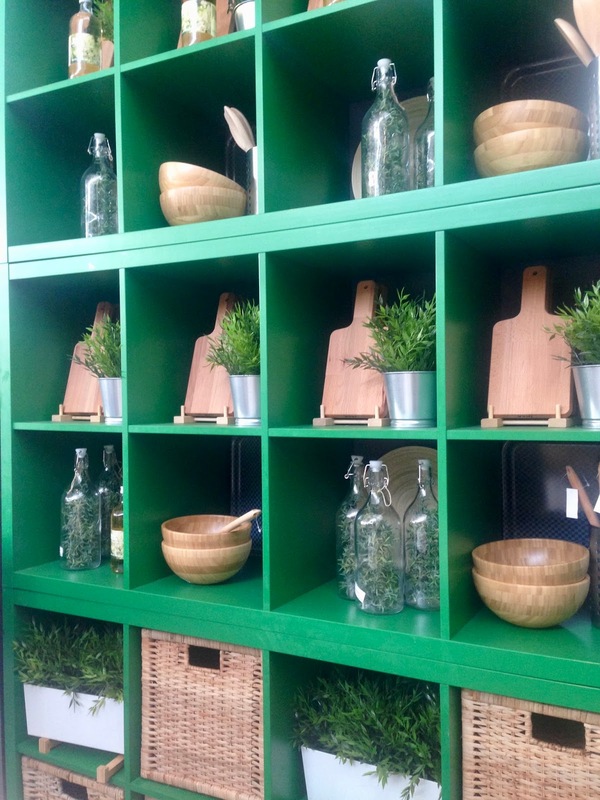 Our table was located right next to this green shelving unit. I was really drawn to this display. I liked the mix of wood, metal, and greenery. Greenery is the one design element I saw constantly in all the IKEA displays. Every room, every display had a green plant! I was looking for night stands for my guest room remodel. I didn't find any I liked (hubby ended up making them) but these t.v. tray stands caught my eye. As always, I was drawn to the millennial pink one. Does that happen to you? Do you fall in love with a color and just want to buy everything in that color? It's been that way my entire life. I can remember back in the eighties loving the color peach. Everything I purchased had to be peach. My wedding colors were even peach. Next year we will be remodeling our living room; which is basically a small sitting room. I'm already starting to formulate and gather ideas for it. I liked this fun end table and the robin's egg blue chair in the distance. We will also be replacing the sconces in that living room. Right now I have gold upright sconces that my husband's uncle said "Looks like they belong in a funeral home" (yes, his family is really that rude). So, I've been thinking of getting new ones, as the ones I have are about 25 years old. I thought these looked pretty cool. What do you think? 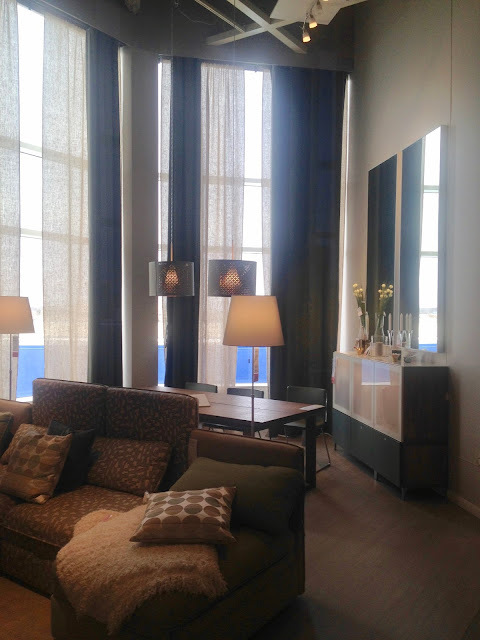 Here are those same sconces in an actual living room display. I think they look really nice. This living area display really impressed me. I loved the tall mirrors above the buffet and the pendant lighting. This kitchen reminded me so much of my own kitchen (except I have wood floors and a blue counter top). When I bought my house over 25 years ago and we remodeled our kitchen, I went with a very traditional look like this because I knew how expensive and difficult it was to remodel a kitchen. I didn't want it to look dated in ten years. With the exception of the counter top, I'm pleased we made the decision to stick with a traditional design in our kitchen. IKEA always has such great ideas on how to save space in your home. I love the under the counter mug holder in this kitchen. 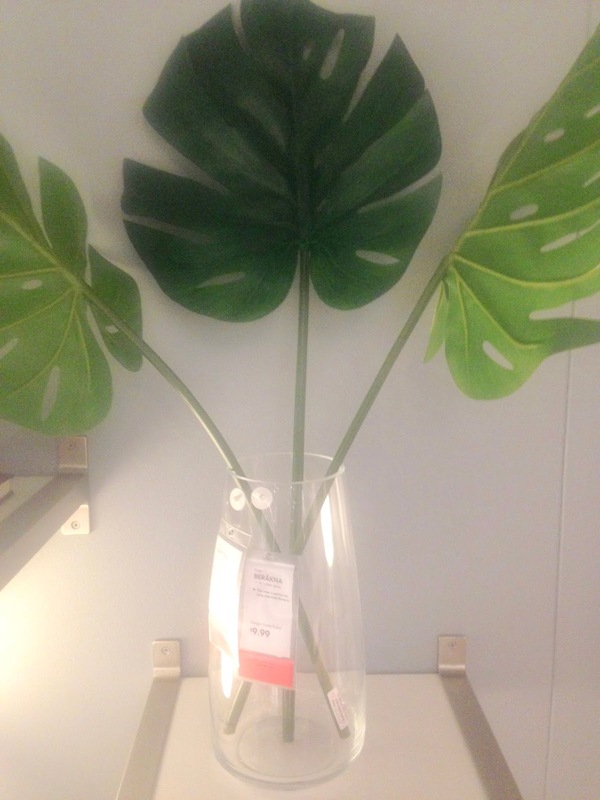 I kept seeing these large smycka leaves in all the IKEA displays and really liked them. I ended up buying two for my own home, but then I couldn't find a spot in my 3000 square foot house where I thought they would work. Go figure. I ended up just throwing them in a vase in my sun room. Hopefully I won't forget they are there and someday find a better use for them. 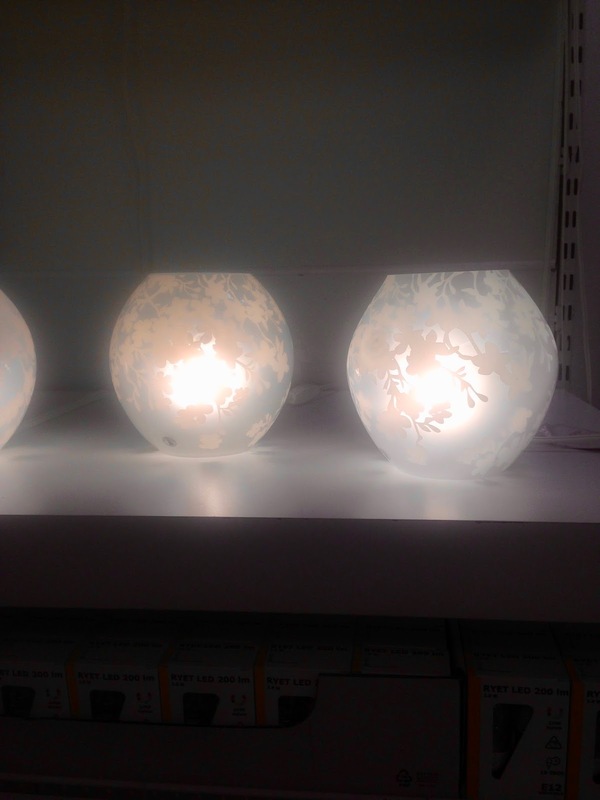 I also really liked these lighting fixtures, and at $14.99 they were quite a steal. But I didn't buy them because I couldn't think of a spot for them in my home. I have finally reached a point in my life where if I don't think I have a spot or a need for it, it does not come home with me no matter how much I love it. I don't want any more useless clutter. On this trip I was specifically looking for a new duvet cover for the guest room remodel. I originally wanted just a plain white or off-white cover, but Ashley talked me into this light grey one. It has slivers of different neutrals in it (white, grey, dark grey) plus just a hint of pink. It's hard to tell in this picture, but you'll see more detail when I do my big guest room reveal. I will need a new t.v. stand when we remodel the living room next year. This mid-century one caught my eye. 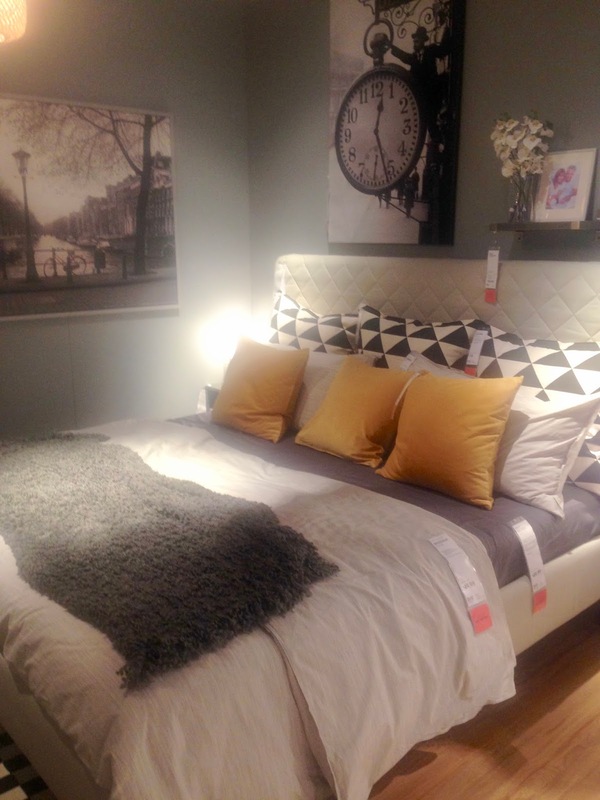 Our trip to IKEA was so much fun. I couldn't believe we spent the entire day there! But it was so much more than just a shopping trip. It was kind of like we went to a "Home and Garden Show". We didn't buy much. I think the only thing I purchased this day was the duvet cover. But we learned so much and left with a lot of creative ideas for our homes. If you're in the "thinking phase" of a new remodel, I highly recommend strolling around your local IKEA store. You will be so surprised at the creative juices it stirs up in you. The funniest part of this entire story is that this was the first time I've been to an IKEA store since 2009, and that was when I was Italy! I've never gone to an IKEA in America before. Then, my dear friend and I went shopping in Minneapolis a few weeks ago and guess where we stopped? You guessed it, IKEA! And we had lunch there too! Only this time, I ordered the Swedish Meatballs at my friend's recommendation and it was very good! I also spent a lot more money on my second visit than I did my first. I kept thinking "It's not like I get here often so if I see something I like I better grab it.". Needless to say, I broke my own rule and came home with a lot of things I didn't have a spot for and didn't need: like the smycka leaves. Oh well, a moment of weakness. So what about you? 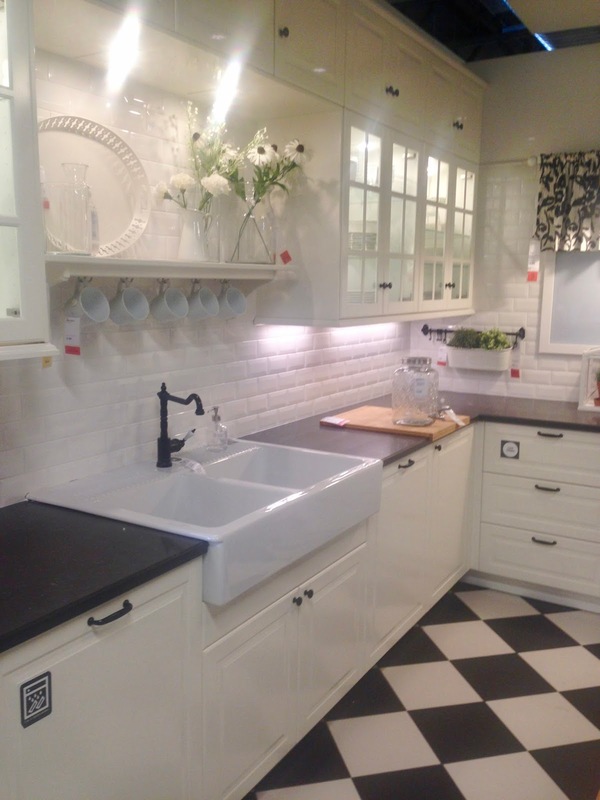 Do you shop at IKEA stores? Do you like them? Would you ever make a day of it like my daughter and I did? I'd love to hear from you! Oh, you are so lucky! Most people live a great distance from one. I know this chain from Germany and was so excited when I discovered some years ago they have two in the Chicago area. One really does need to spend a whole day there, especially when it's not close to home. It's been a few years since we went, and I really want to go back soon! Still hoping they will open a store closer to where I live. Looks like you all had a fun day, and that kitty you found is so cute! That is how I was introduced to IKEA: in Europe. And yes, it does take an entire day to stroll through one of their stores. You should pick up one of the kitty stuffed animals if you go. They are so soft. 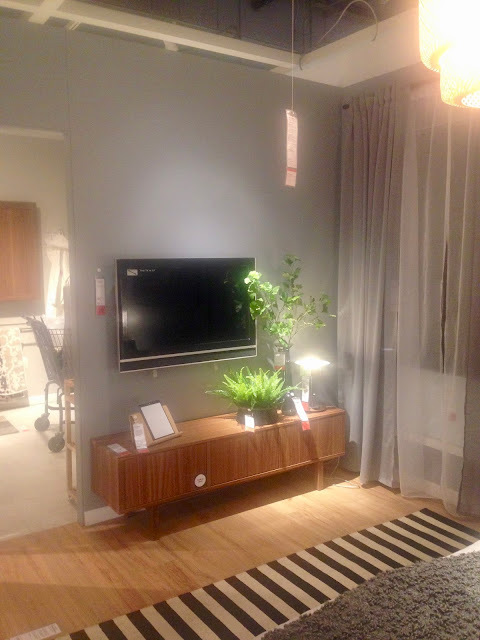 Forgot to say, love the style of that TV stand! Modern with a retro look! 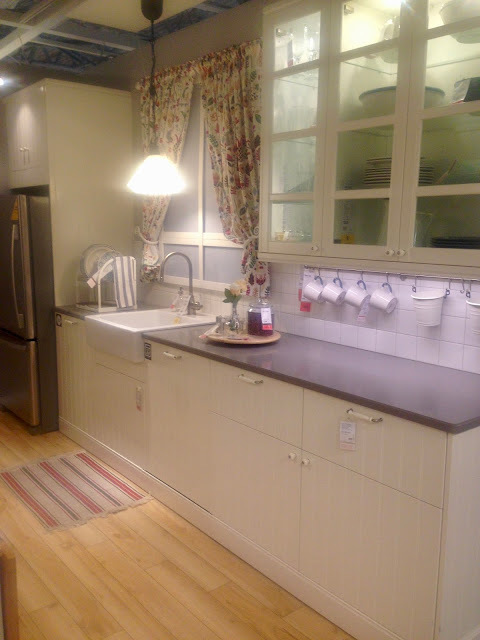 I can definitely see why Ikea is such an adventure. I haven't been to one in years, but I used to live very close to one. I am loving all the pendant lights in these photos. Everyone always says they haven't been to an IKEA store in years, and yet it's always crowded the three times I've been to one. So funny. The IKEA stores in my city are very busy. I haven't been to one in years. Isn't it funny that they are always busy yet most people say they haven't been to one in years? I've never been to one. The nearest one is in Atlanta GA and thats two hours & 45 mins. from me. Although I'd love to just have the experience, I doubt I'll ever go, so I really enjoyed your tour. They are quite the experience, so I hope someday you'll get to one! I love Ikea Amy but you can get lost for hours can't you? 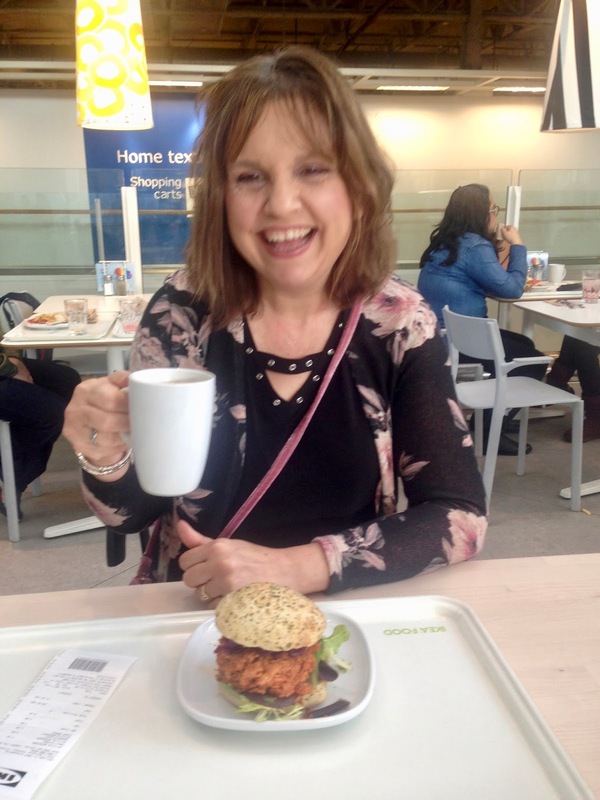 You need to keep following the path LOL:) Thanks for linking up and sharing at #MLSTL I do like the kitchen you have shown in your photos we are looking to renovate so maybe a trip to IKEA is in order. Yes, the stores are so huge it's hard not to get lost. Good luck on your kitchen remodel. You have made me want to make a trip to my Ikea. I always get such great ideas but I seem to buy things then not use them. I know Victoria! It happens to me too! It's hard to resist. I've only been to IKEA a couple of times and the sheer magnitude of it overwhelms me. You follow the maze and hope somehow you'll find your way to the end. There are no easy exits and I can't even imagine blogging about it - I'm too busy getting distracted by all the interesting knick knacks and furniture! I know how you feel Leanne, it can be so overwhelming! We got lost twice! I've only been to IKEA once, and I lost my husband who wandered off and didn't have his phone with him. I had to get a callout for him over the loudspeaker - like a lost child! We laughed for days. But I did enjoy looking at all the cool stuff before I started worrying about where he'd got to! Must go back! Oh my, that would be a nightmare! My husband and I got separated at the Mall of America in the age before cell phones. We were both crying when we finally found each other hours later. To me IKEA is an adventure also. we have two IKEAs, and both are equally far from our house..
That seems to be the theme in all the comments...IKEA stores are far away. They need to build more! But they are so big, I think that limits where they can be built. I love the meatballs at IKEA!!! Yum!! We just got an IKEA store in St. Louis and I've only be in there twice. I actually took the kids for their first time during their Spring break 2 weeks ago. It was so much fun! They really enjoyed it as well. I saw that same exact subway tile in their kitchen area and really liked it. 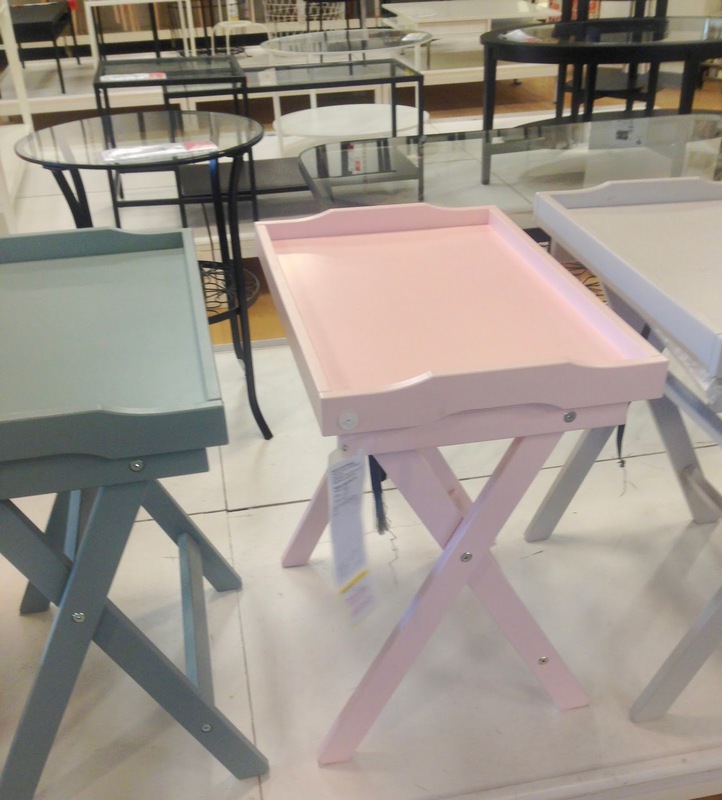 I didn't see those TV tray tables, but they would make a cute end table/nightstand. I did come home with this ladder thing that has buckets on it. Its supposed to be for plants! 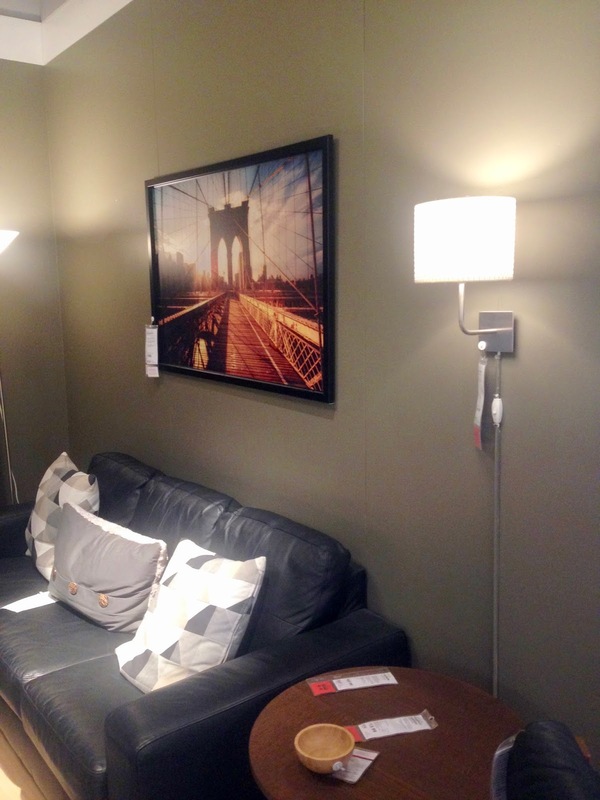 How cool that you went to an IKEA in Italy! I saw that ladder thing and it also almost came home with me! 😂 I think a lot of people don't go to IKEA often because they are so huge and it's an all-day event when you go to one. I can understand why. I actually didn't enjoy my first experience to IKEA at all. I thought everything was too cheap looking back then. Now, my tastes have changed a lot since then.